Correction for Base Metals – Platinum to Outperform Gold – Energy Bullish into Mid-Year! This time last year, in January 2017, Base Metals led by Copper were trading into a sideways pause within uptrends that began from the Jan/Feb.’16 lows. Whilst, Precious Metals were just ending corrective declines that began from the summer 2016 heights but were preparing to resume larger uptrends. And Energy Markets such as Crude Oil were about to begin a sizable correction that eventually ended several months later. These disparate rhythms are not unusual for these different commodity sectors over periods of several months but it does emphasise just how important it was when they all converged into simultaneous lows back in Jan/Feb.’16 – we termed this event as the grand ‘RE-SYNCHRONISATION’ process. It was a time when Developed Markets (DM) and Emerging Markets (EM) & Commodities ended major counter-trend declines at exactly the same period which resulted in triggering the 2nd Phase of the ‘INFLATION-POP’ where asset prices undergo another multi-year price advance, similar to the gains that unfolded immediately after the lows of the financial-crisis. The upside progress for each sector has been uneven though, and this is again something visible in the Elliott Wave pattern progression for this coming year, 2018. Intermediate-term peaks and troughs will occur at different times although they each remain within the larger multi-year uptrend of the inflation-pop. Exactly which sector forms peaks first or troughs later depends on various factors, including the path of the US$ dollar as all are still predominantly priced basis the U.S. currency. This latest Annual 2018 Commodity Outlook remains overwhelmingly bullish for each of the three sectors we analyse over the intermediate/medium-term. However, shorter-term, there are some downside retracement risks that lie just ahead. This may have something to do with a minor US$ dollar rally which would force a counter-trend correction for some key areas as 2018 begins. The US$ dollar isn’t quite yet ready for a sustained recovery as 2018 gets underway – rather, we expect this to begin following a low in May/June ‘18. 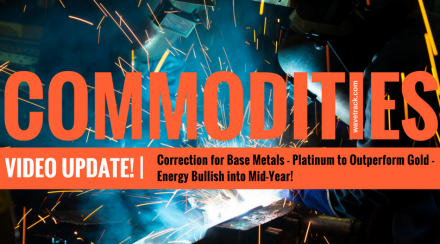 Base Metals have unfolded higher from their synchronous lows of late-2015/early-2016 into five wave impulse patterns which are labelled as 1st waves within much larger uptrends. But these are vulnerable to a hefty 2nd wave retracement that pulls prices lower for several months. We can see the same occurrence in various Emerging Market stock indices, like Brazils’ Bovespa (see Part I Stock Index 2018 Outlook). For Precious Metals, there is some short-term downside risk into Q1 ’18. However, overall, our analysis indicates 2018 will be a very bullish year for Gold, Silver and especially Platinum which is set to undergo a revival. Eventually Platinum will turn around its discount to gold into its historical norm of premium. This report also updates several MINING STOCKS, from the Base and Precious Metals sectors – including BHP-Billiton, Freeport McMoran, Antofagasta, Anglo American, Kazakhmys Copper, Newmont Mining, GoldCorp, Barrick Gold, Agnico Eagle Mines and AngloGold along with several mining indices. Energy indices like the IXC iShares Global Energy and XLE Energy SPDR are updated for the year’s outlook along with the underlying contracts of Crude and Brent Oil. We already know that these two contracts have broken higher. This is in-line with our medium-term bullish forecasts, but one major question that must still be answered! Whether the primary degree zig zag patterns unfolding in the advance from 2016’s lows end later this year, then resume major declines, or whether those declines are corrective leading to new record highs into the end of the decade and beyond? This video report attempts to answer that dilemma along with updates for price highs for 2018. These are some of the themes we’ll be talking about in our latest video. For 2018, we expect to see some huge price movements across the three major sectors. Although, they aren’t necessarily going to be uniform in their price development. Base Metals are an indicator of the overall global economy. To define its rhythms of growth and decay and this will be key to understanding how this year’s overall path of global expansion is developing. Precious Metals are either on the verge of breaking higher to resume the next stage of the ‘inflation-pop’ or they’ll turn lower for a short while to prolong last year’s correction before resuming uptrends later. The Energy sector including Crude/Brent oil are already surging higher. Here we’ll be taking an in-depth look at both preferential and alternate counts to see just how far these price gains can last. This new 2018 COMMODITIES video is like nothing you’ve seen anywhere else in the world. It is unique to WaveTrack International, how we foresee trends developing through the lens of Elliott Wave Principle (EWP) and how its forecasts correlate with Cycles and major contracts of other asset classes from around the world. We invite you to take this next part of our financial journey with us. Video subscription details are below – just follow the links and we’ll see you soon! Each video runs for at least 1 hour 20 minutes and it’s packed with SPECIFIC Elliott Wave price-forecasts (the Stock Index Video is already 1 hour 57 mins. long! and cover 57 chart – click here for full table of content).
. And the latest COMMODITIES video covers 67 charts and is 2 hour 5 mins long. PS: Part III for Currencies & Interest Rates will be published towards the end of January/beginning of February 2018.